There were plenty of weird game publishers out there, Amiga, Milton Bradley, and Zimag are the first that come to mind. There is one publisher that I think stands above the rest, or at the very least is on par with the strangest of them, Avalon Hill. Avalon Hill made unique, innovative, and very complex board games, though I’ve never played any of them myself. These guys weren’t a one-and-done publisher; they actually managed to release four games on the 2600 before packing up shop and moving to greener pastures, mainly the burgeoning world of home computers. I managed to get my hands on a copy of London Blitz with the manual, and looking through the back of the manual it seems Avalon Hill was really ahead of the curve in the computer world. With releases for the Atari 8-Bit line (Tape and disk), C64, VIC-20, PET, TI-99/4A, Timex Sinclair (wow), TRS-80 I/III (Tape and Disk), the Apple II line, and even IBM Compatible PC’s, these guys had their bases covered, and in the case of one of their games, B-1 Nuclear Bomber, it was released for every system listed above, talk about accessible. I don’t know how successful Avalon Hill was in the home computer world, but it seems they made it through fine and are still a functioning company today, which is more than one cans say about almost all the big game publishers from back in the 80’s. Let’s move on to the actual subject of this review, London Blitz, here’s hoping it has that innovative flair that Avalon Hill seems to be known for, starting with the graphics. Ow… my eyes do not like the look of this game one bit. This game is horrendously ugly, let’s start at the beginning. 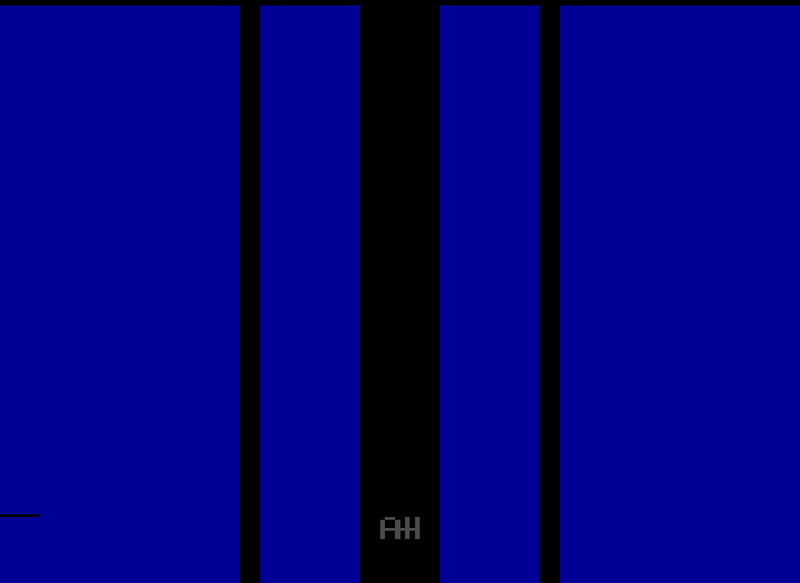 When you boot up the game you are presented with a blue screen with “AH” at the bottom, this is ostensibly the difficulty select screen, though when I first started up the game I thought the thing was bugged for some reason, (It looks like Philip the Wonder Machine got his claws in it). 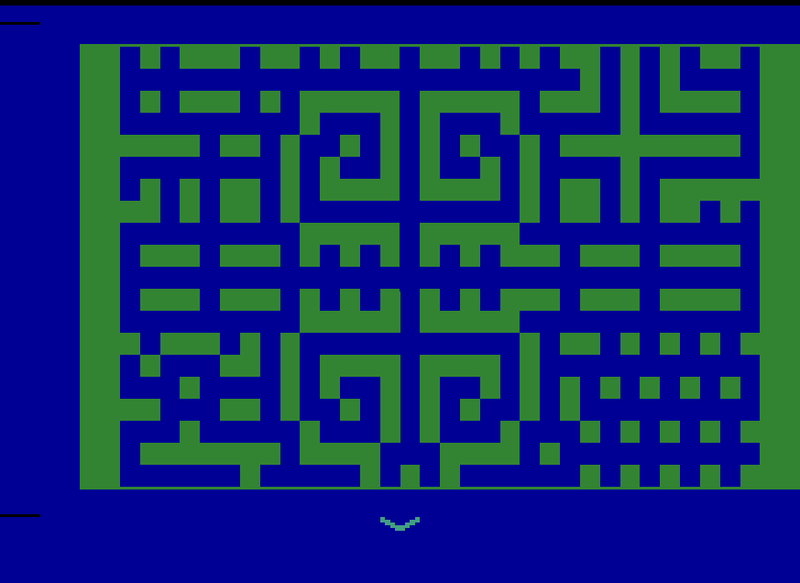 When you’ve selected your difficulty you’re then shown the map screen which looks pretty much like the map from Tunnel Runner or Sword of Saros, it’s fairly generic, but it does have one cool element, you can scroll up and down which shows you just how big this maze actually is. The color scheme is only mildly offensive with a deep blue coupled with lime green, I’ve seen worse. 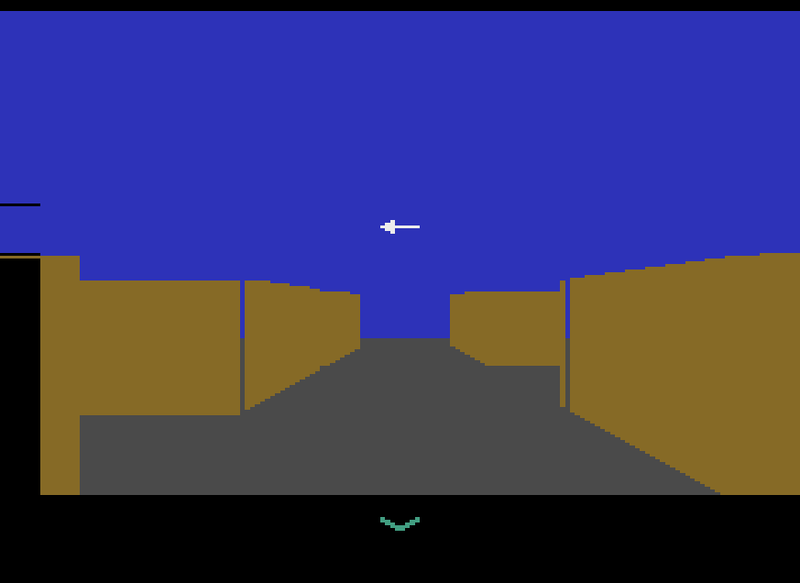 The maze itself is just awful in that everything looks exactly the same, which is par for the course with these types of games, but it just feels off. There is no feeling of fluid movement you just jump to the next square, the color scheme does not help with this, the sky is blue, the floor is grey, and the walls are a drab shade of beige. You can also see through the walls slightly if you look between the cracks between segments that flicker like crazy. My biggest complaint with the maze is that the walls are just too short, I feel like I could see over them if I got on my tip-toes, these are more like fences than walls, and it’s hard not to notice it once you realize it’s there. The only other thing you’ll see are the bombs which make the screen flicker obnoxiously when they’re on screen, and the bomb screen, which is a close up of the bomb with a side panel open. The bomb screen is actually very well detailed so I will be abstaining from complaining about anything pertaining to this screen. Well with the graphics out of the way we must move on to some more complaining with the sounds! Ow… My ears do not like the sounds this game makes. When you start the game you will immediately be blasted by the grumbling crunching noises that the tanks make in Combat, this will be your constant companion in the maze section. It only changes when you begin moving, then you’ll get a fairly standard engine noise that isn’t too bad, but it will wear on the nerves after a while. 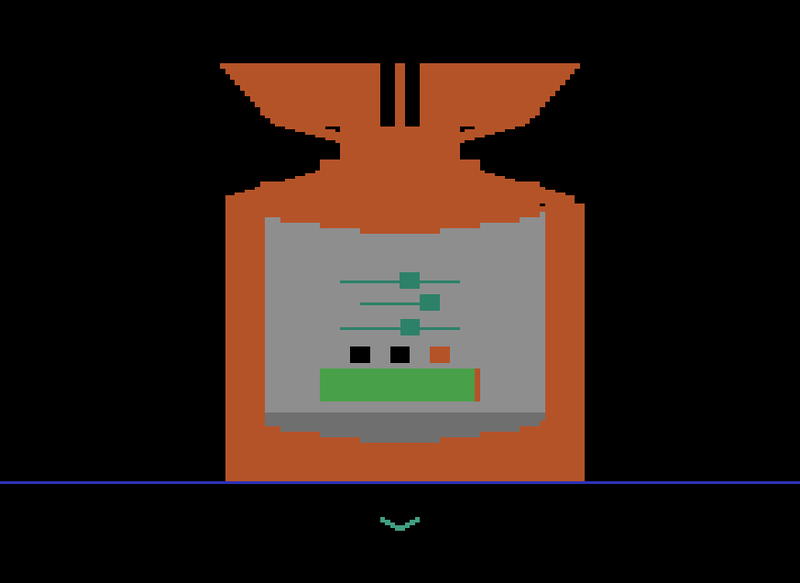 While in the bombs screen you’ll only have several beeps of different frequencies and pitch to deal with and a very disappointing explosion noise if the bomb explodes but there is nothing annoying present. I’m out of sounds to talk about let’s move onto the gameplay. The controls are truly something else in this game, oftentimes they will be unresponsive to the point of frustration but will sometimes be so sensitive that you’ll crush the controller against your forehead. While in the maze section you will be dealing with the hypersensitive controls which will cause you no end of trouble and navigating the maze is made 10 times more difficult than it needs to be since you keep getting turned around even with the lightest taps of the joystick. 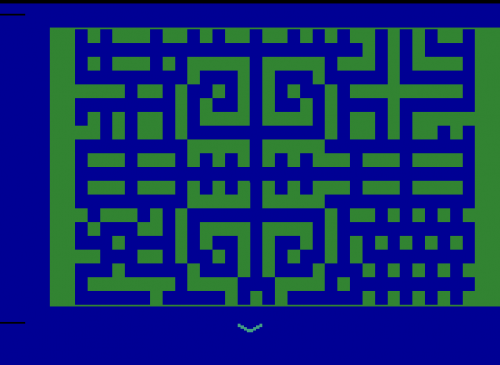 The only thing that keeps the maze section from being unbearable is the small arrow in the center of the screen that tells you which direction you are currently moving in. You press the action button to bring up the map, or I should be more accurate and say you press the action button several times to bring up the map (I know that the thing is probably on a delay but I still find it somewhat annoying), you then press it several more times to get back to the maze section. When you find a bomb you walk up to it and press the action button, you will then be taken to the bomb screen. 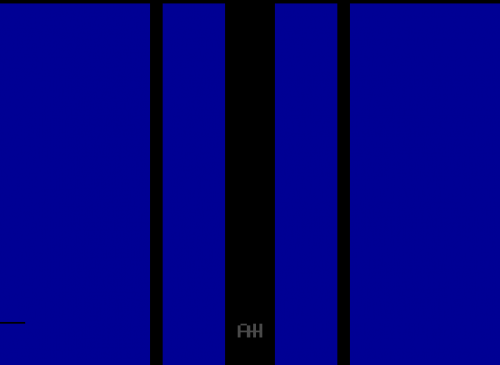 There are three sliders, and three colored squares indicating the sliders, the far left is the top, the center is the middle, and the far right is the bottom, below the squares is a green bar, this is your timer, it moves down very slowly except when it turns yellow then it moves slightly faster. All you need to do to disarm the bomb is get the sliders in the proper positions, the colored squares will change color to indicate whether you need to move them left (red), right (green) or if the slider is in the correct position (black). To test if you have the sliders in the correct location you scroll off the sliders so that none of them are lit up and tap left on the joystick, the squares will change to indicate what you have to do next. You will encounter three types of bombs, the standard slider which is green, the random automatic where the sliders will move between 16 different positions and you must select the correct one based on the colored squares (these are blue), and the random where the colored squares randomly indicate a different slider after every test (these are orange). All you do in London Blitz is run around a gigantic unchanging maze looking for explosives to disarm in the same three ways over and over again until the game decides you’ve had enough and either ends on its own or blows you up. The game is visually bland auditorially challenged and boring to play after the first few bombs. I’ll give the game credit for being inventive, unique, and actually fun the first few times, but that doesn’t change the fact that it just doesn’t hold up. The game holds up even less when you remember that Bomb Squad on Intellivision exists. Since this is an Avalon Hill game the prices aren’t cheap, I managed to snag my cart with the manual for 22 bucks, which is the lowest price I’ve ever seen for this particular title. If you want to snag one right now there are loose copies on Ebay for anywhere from $28-$99 with boxed copies being listed at $99-$283. Buy with caution, or just stay away, this game goes straight to the Collector’s Zone, it’s just too expensive for what you get. Yeah, Gamebase 64 has 57 games by Avalon Hill, of which I may have played 1 or 2. Some board/war games, but just as many sports games which is a bit surprising as one would imagine AH to be battling neck to neck with SSI for the war games category. Previously I looked up that they have a C64 game called London Blitz, though programmed by someone else and may not have more in common with the 2600 game than the title and publisher. I thought about trying to track this game down last year, just to represent Avalon Hill in the cartridge rack. It lost to Wall Ball. I just can't picture someone, in 2019, getting really INTO this game. It seems to rely on a cerebral, imaginitive intensity, and the player has to generate all the imagination themselves. This might have been all ya could hope for in the early 80's but now a game like this is asking the player to look past a lot. Meh. I could see this game might be interesting to see if you could train a modern AI machine to play and see what it would do. Anyways, yeah on Avalon Hill I guess I'm more about Wall Ball. I thought about trying to track this game down last year, just to represent Avalon Hill in the cartridge rack. It lost to Wall Ball. Yeah I just wanted to get a cart for Avalon Hill on the shelf, I honestly would have preferred any of the other three but I was limited by what was listed and the fact that you can't find an Avalon Hill cart for anywhere resembling a reasonable price these days .Wall Ball is an excellent choice! Perhaps one of the strangest licenses to ever be on the 2600, Sports Illustrated. The real question is... How much did you overpay for your copy? Actually I think I was pretty lucky on this one. It was around 20 bucks if I remember correctly. It was just a loose cart tho. I'm not surprised if the price went up a lot in just this short a time. Some of the obscure games have skyrocketed. I couldn't believe I saw Boing listed for over $500 recently. I couldn't believe I saw Boing listed for over $500 recently.